The popularity of wood countertops has endured the changing times and trends as new countertop materials have been introduced over the decades. Even with the seemingly endless options available today, wood remains an attractive choice for kitchen countertops in high-end homes and rustic cabins alike. What Is The Best Wood For Kitchen Countertops? Wood has a knack for fitting in with all design styles, looks nice combined with other types of countertops, is resilient and can be refinished, offers many design options and eco-friendly versions like reclaimed wood from old barns or floors and sustainable harvest woods like bamboo. 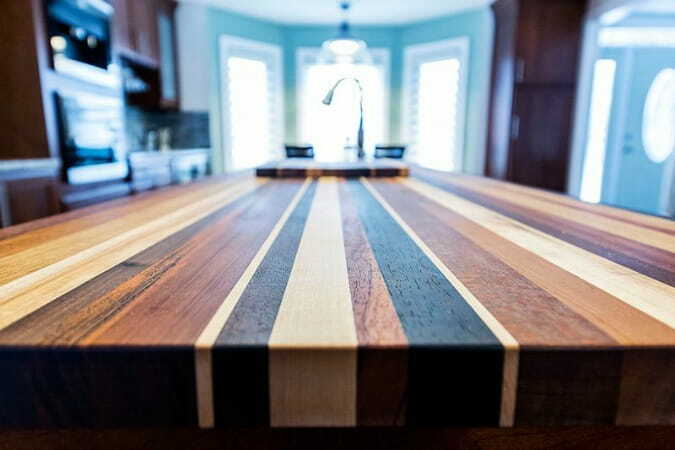 Wood and butcher block countertops are enjoyed around the world for their warmth, beauty, and usability. In this Countertop Specialty buyer’s guide, we’ll explore the pros & cons, wood species and grain, finishes, cost, cleaning, buying and installing wood countertops. Wood (along with stone) is the original countertop surface in use since the dawn of time and we were cooking in caves. 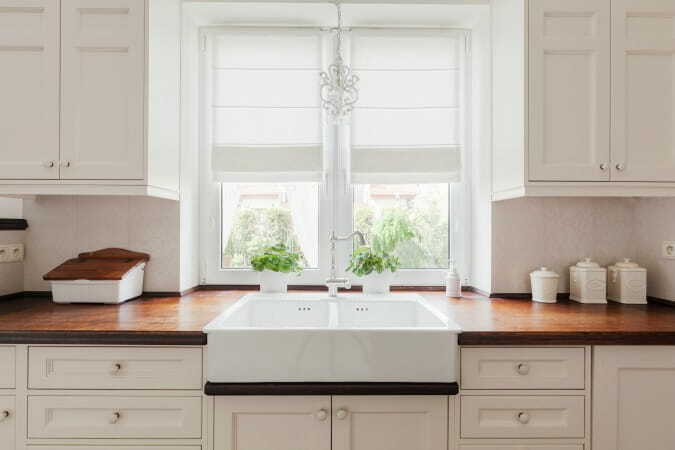 The first countertops were made of stone or wood since these materials were readily available. The history of butcher block is somewhat debated, but most agree that sometime in the late 1800’s is when this type of countertop came into existence. Prior to that, wood countertops were just trees cut to a flat surface and later butchers cut meat on tree rounds balanced on wooden legs. Aside from being an unstable surface to work on, these tree rounds would crack and split. 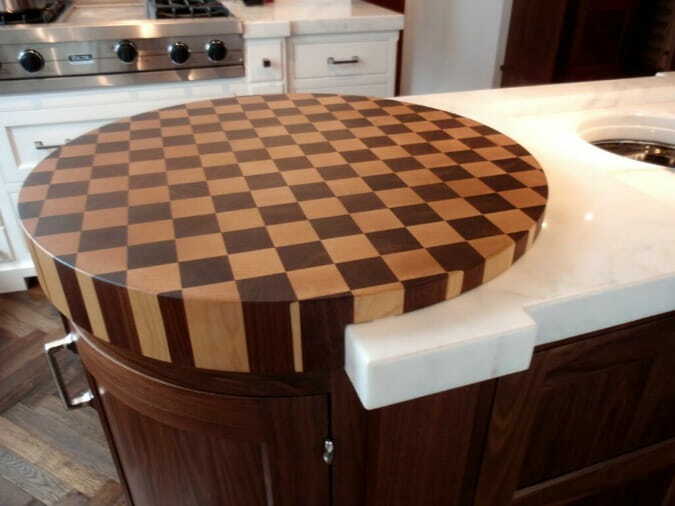 Out of the necessity to create a safe and sanitary workspace for cutting meat, the butcher block countertop was born by gluing together strips of Maplewood which proved much more durable eliminated the cracking and splintering problem. Wood and butcher block countertops are an ideal choice if you like that warm, rustic vibe or as a contrast to other kitchen countertop materials. Wood has many positive benefits. But it also requires some extra work and care. Check out the pros and cons of butcher block and wood to see if this surface may be right for you. Wood countertops are made from strips of wood laminated together in three different ways - face up, edge up, or end-grain up. These 3 different methods each have different qualities concerning look, function, and durability. How you intend to use your countertop will determine which grain orientation you’ll choose. Good for cutting and chopping due to its thickness and stability. 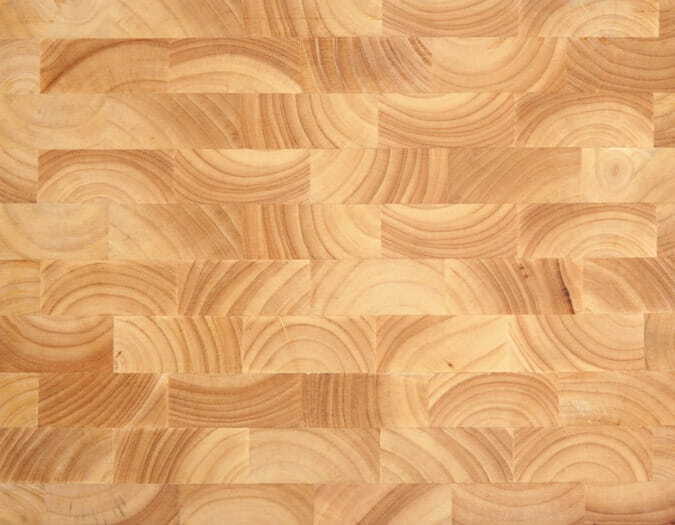 Several types of wood can be used for butcher block and wood countertops. New woods are being added to the growing list of materials every year and generate a wide array of pricing. Listed below are top wood choices for kitchen countertops because of appealing factors like color, hardness, and grain structure. Hardness of the wood is one thing to consider when choosing a species for a countertop. Harder woods will take more abuse, wear better, and last longer given the same level of care. This doesn’t mean you need to buy the hardest wood possible. A softer wood well-cared for will still last a long time. The Janka Scale is used to rate the hardness of woods on a scale of zero (soft) to 4000 (so hard it’s difficult to cut). Really most woods you would consider are going to be hard enough, but the Janka ratings are interesting and may help you make a decision. The finish acts like a wood countertop sealer. It’s how to make wood waterproof and prevent liquid penetration that can stain or cause the wood to swell or warp and the seams to split. It also keeps the wood from drying out. Basically, the finish maintains the wood in optimum condition. 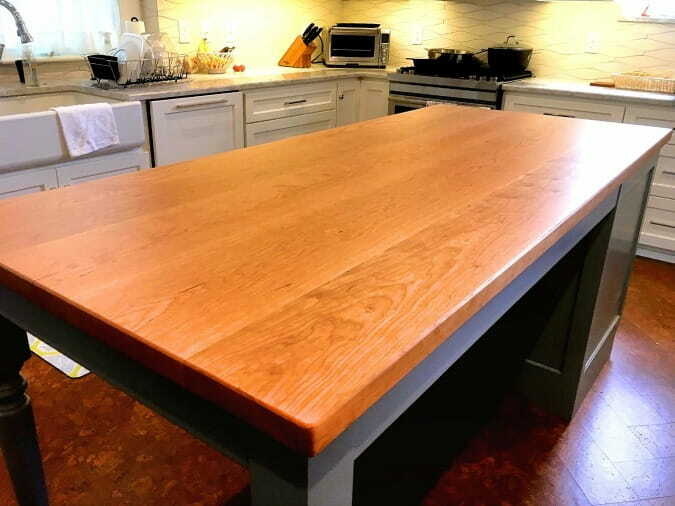 The most common products for sealing butcher block countertops, tables, islands, and wood are oil or wax finishes that should be reapplied monthly or as needed. Mineral oil provides some protection but not against long-standing liquid spills. Tung oil penetrates deeper and cures to form a film that gives better protection than mineral oil against water. Wax or Mineral oil + Wax adds another layer of protection and seals oil into the wood. Polyurethane is a permanent coating that must be stripped off for any repairs or resurfacing. Used more on decorative wood like serving or dining tables. Not for use on food-prep surfaces. Waterlox is a combination of tung oil and resin that is supposedly waterproof and likely best choice for a durable finish on wood countertops. Apart from oiling and applying a surface finish, here are some additional tips to keep your wood counters in top condition. Use the same care and maintenance for a butcher block table or island. Clean wood by washing with hot soapy water after every use. Dry the wood surface thoroughly with a soft piece of cloth or a sponge and make sure no moisture gets absorbed into the wood. Harsh chemicals or detergents spilled over its surface may lead to cupping or cracking that cannot be repaired. Disinfect it regularly to destroy the bacteria left behind by raw foods. Mix 1 part of household bleach into 10 parts of water. Dip a scrub brush into this solution and scrub the countertop well. Rinse it off with clean water and dry it well with a clean piece of cloth. Nicks and scratches can be lightly sanded and the surface re-oiled. Remove sticky residue from wood countertops by gently scraping it off first with the help of a putty knife. Then use a 60-grit sandpaper to clean off the remaining part of the sticky residue. Complete the repair by sanding with 120-grit sandpaper. Sand the surface of wood countertops going with the grain (or in small circles for end grain butcher block tops) and do not sand the same area for a long time. If you do so, it is likely that the surface of the countertop will become uneven. Remove stains using a combination of table salt and lemon. Make a paste of lemon juice and salt and spread it over the countertop and leave it untouched for a few minutes. Then clean it off with a towel soaked in cold water and then wipe off the excess water with a dry cloth. Butcher block countertops should not be exposed to either excessive heat or cold. Depending on several factors (i.e. type of wood, edges, grain orientation, thickness, fabrication, shipping and installation variables) wood and butcher block counters cost between $15 to $250+ per square foot, but the average cost runs $75 - $110 for flat grain construction. Edge-grain will typically cost about 5% to 10% more. End-grain butcher block countertops cost 30% - 40% more than flat grain for the same wood species due to the extra wood and labor involved. Extra thickness is needed for strength when making end-grain butcher block which is why more wood is used for the same-sized countertop. Shipping to your location (if needed) will be extra ($150 - $300) and installation ($200 - $300) may be charged separately in many cases. Is butcher block cheaper than granite? Comparing wood countertops cost vs. granite really depends on the specific wood species or granite color used. We can make a general comparison, though. Granite countertops run between $35 to $200 a square foot. So, in a broad sense, the cost is similar to wood and butcher block countertop prices. However, the average cost of a granite countertop installation is higher at around $45 to $65 psf. And the lower-cost woods like birch can be a lot less than granite at $15 psf. So it’s possible to install wood counters for less, but it could cost more than granite in some cases as well. Wood countertops can be made and installed by local countertop fabricators, purchased pre-made at local stores like Ikea or Lowes or national wood countertop makers like John Boos for professional or DIY installation, or the whole job can be done by a fairly competent handyman. When installing butcher block countertops, remember to make allowances for humidity changes. Make sure that the butcher block top has sufficient ventilation as wood can expand and contract with changes in temperature. When humidity in the kitchen is elevated, butcher blocks will tend to absorb the moisture causing it to expand. During times of less humidity, such as in the winter, it will contract. A wood countertop is heavy and needs to be mounted on a 3/4” plywood surface. Most cabinet makers slot all the mounting holes allowing the countertop a degree of freedom. If yours has been slotted, make sure that your bolts are placed in the middle of the slots. This will allow for both high and low moisture conditions. If the slots aren’t there, fix this yourself by drilling holes in your plywood 3/8” bigger than the lag bolt's shaft. 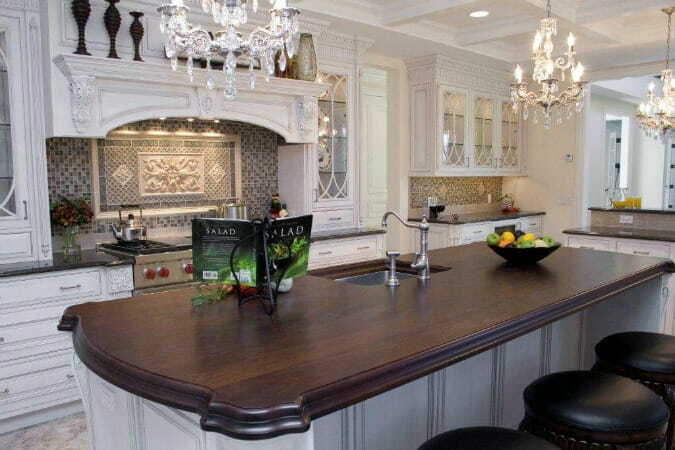 Wood countertops have stood the test of time and continue to find a place in all types of kitchen designs even with all the fancy new countertop materials out there. In fact, wood and butcher block countertops mix very well with just about any other type of countertop surface. The warm beauty of wood just blends well adding interesting textures, colors, and patterns. Wood countertops are made from strips of cut wood in 3 orientations: face grain, edge grain, and end grain. The last two are used to make butcher block countertops and stand up to heavy use and cutting much better than face grain which is more decorative for serving or dining areas. 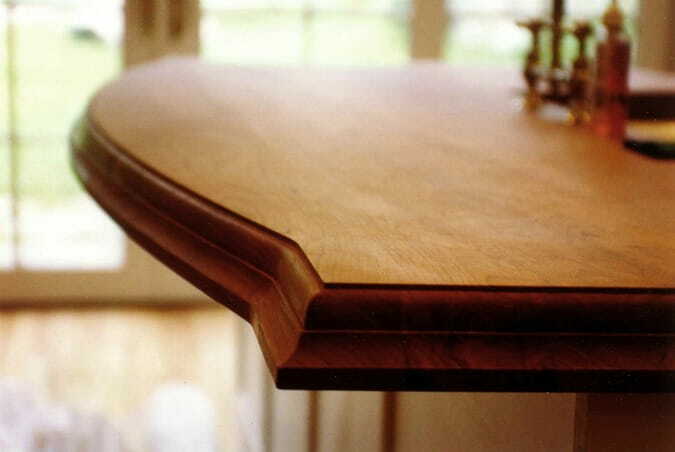 Wood Countertops are durable but susceptible to different types of damage. Wood is prone to dents, scratches, and cuts, can stain and burn, doesn't like water or chemicals, may warp, and seams can pop. Good news is that regular oiling of the surface will prevent many problems. Also, wood and butcher block countertops can always be refinished to basically new condition. 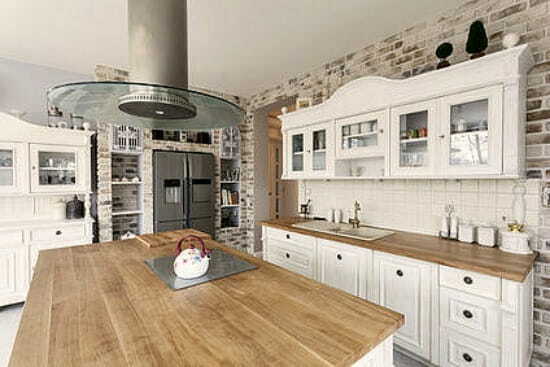 Many different species of wood can be used for kitchen countertops. Some are very expensive but cheap varieties exist and DIY installation is totally doable. Although usually, wood counters are custom made by local fabricators or purchased as pre-made butcher block tops from national retailers and some big box stores like Home Depot or Ikea. Wood countertops and butcher block countertops can be an attractive and functional addition to your kitchen so long as you keep up with the proper care and maintenance. Do that and they'll serve you well for many years.